An absolutely gargantuan black hole 800 million times the mass of the Sun has been discovered 13 billion light-years away, and it's sent the way we think about the early Universe into a spin. It's the most distant black hole ever detected, from when the Universe was just 5 percent of its current age - around 690 million years after the Big Bang. "Gathering all this mass in fewer than 690 million years is an enormous challenge for theories of supermassive black hole growth," said Carnegie Mellon University's Eduardo Bañados, who led the study. Previously, the earliest known black hole was from when the Universe was about 800 million years old. The black hole in question, J1342+0928, sits in the centre of a super-bright disc of orbiting gas in the centre of a galaxy, forming an object known as a quasar. It was discovered in the data from three large-area surveys: z-band data from the DECam Legacy Survey at the Cerro Tololo Inter-American Observatory in Chile; and infrared data from NASA's Wide-field Infrared Survey Explorer and the UKIRT Infrared Deep Sky Survey. Quasars are the brightest objects in the Universe, and some emit light thousands of times greater than that of a large galaxy. Black holes don't emit light, of course. The light is caused by the accretion disc around the black hole, dust and gas swirling at tremendous speeds, generating immense friction as it is pulled by the massive gravitational force of the feeding black hole in the centre. In spite of their great brightness, all the quasars found to date are so far away that they can't be seen with the naked eye - they can only be observed with telescopes. They're really valuable tools for studying the early Universe, though, because the light can be analysed to reveal information about the hydrogen it has travelled through on its journey to Earth. And J1342+0928 is so old that it can tell us about a crucial point in our Universe's history - the Epoch of Reonisation. As it expanded, it cooled, causing protons and neutrons to start to combine into ionised hydrogen atoms; and, about around 240,000-300,000 years after the Big Bang, these hydrogen atoms attracted electrons, coalescing into neutral hydrogen. At this point, light could travel freely through the Universe, since it was no longer scattering off free electrons. But it wasn't until gravity started to pull together the first stars and galaxies in this murky, hydrogen-filled void that starlight appeared… and not long after this happened, according to current theories, the neutral hydrogen was excited by the ultraviolet light of these newborn stars, galaxies, quasars or a combination of all three. This effect reionised most of the Universe's hydrogen, splitting it into protons and electrons. By about 1 billion years after the Big Bang, the reionisation process was complete.But exactly when the Epoch of Reionisation began, and the detailed mechanisms of it, are difficult to ascertain. "Reionisation was the Universe's last major transition, and it is one of the current frontiers in astrophysics," Bañados said. This is where J1342+0928 comes in. Analysis of its light shows that a significant proportion of the space around it is still neutral hydrogen, 690,000 years after the Big Bang. This means that reionisation may have occurred relatively late in the Universe's lifespan. 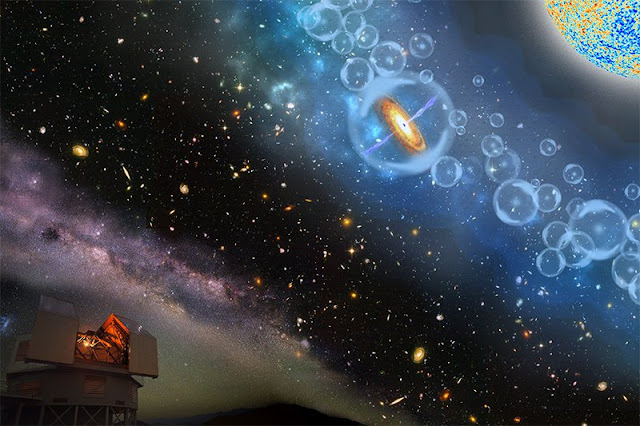 In the illustration above, we can see a schematic representation of what we can learn from this new quasar discover: the observation using one of the Magellan telescope (bottom left) allows us to reconstruct information about the Epoch of Reionisation ("bubbles" top-half right) that followed the Big Bang (top right). But J1342+0928 poses a puzzle, too. It's comparable in mass to supermassive black holes that are around today, which means it must have had a relatively well-stocked galaxy for it to snack on - forming in a very short amount of time, according to our current models of galactic evolution. The discovery was part of a longer-term survey to find early-Universe quasars, and the team estimates that somewhere between 20 and 100 of the objects as bright and as distant as J1342+0928 can be found across the whole sky. By finding more, astronomers will be able to piece together statistical data about the early Universe and Epoch of Reionisation - and hopefully work out a model for galactic evolution that can explain them. "This is a very exciting discovery, found by scouring the new generation of wide-area, sensitive surveys astronomers are conducting using NASA's Wide-field Infrared Survey Explorer in orbit and ground-based telescopes in Chile and Hawaii," said Daniel Stern of NASA's Jet Propulsion Laboratory. "With several next-generation, even-more-sensitive facilities currently being built, we can expect many exciting discoveries in the very early Universe in the coming years."